Maybe they didn't have a template for a back view of a minifigure (which is the same as the front but may come off as kind of odd). If that is the case, I have a solution. I love these, I'd love to see Toa outside of the Toa Mata done in this style. I believe I heard at one point that @exxtrooper was going to make custom minifigures of the toa. Am I wrong about this, or is this still happening? Well, how much do you wanna bribe him to look away from Destiny 2 for three seconds? A wager would be more effective. Okay, I can finally share my thoughts on these. Overall, I think that they're utterly gorgeous. Tahu's probably one of the best, but he always looks good no matter the form, even in Mistika form. Love the colour scheme, especially the return of azure as an accent from Tahu Uniter. Strakk and Gelu proved that white and dark blue work ■■■■ well, and Kopaka is no exception. The scar over the eye is a surprise, but a brilliant idea in retrospect. That cowl in the blizzards would be a striking image. Yellow as an accent was an unexpected choice, but it works well in retrospect. As with Tahu, it's really neat to see Gali's orange accent make a return. There's quite a few shades of blue, but they're not too distracting, and the designs make up for it, pulling the eye back in. Lewa as a girl, huh? Sure, why not, we're getting a female Doctor after all. Having the dark green as a secondary to a lighter one is a genius idea, one we didn't really see before, and the white as an accent is a surprise that works well. Why on earth were people insistent on pink? Just cause Lewa's a girl? It wouldn't have worked. The cape...hmm. I don't know why, but I keep seeing Geonosian wings on Lewa's back. They wouldn't necessary be wings, maybe just a fancier cape, but that's just me. Pohatu looks great. I won't lie, I used to be in the camp of, brown is boring, but I really like his shades, and his accent works well with it, although I'm still very fond of his neon green from G2. I wonder if there's a way to put a kicking function in the sets...? Onua is brilliant; the Axl torso is a stroke of genius. I do miss the purple from G2, but the green and the moss on his armour is an excellent replacement. I must look up their weapons, it's a shame that they aren't mentioned here. So yeah, really good work guys. These look utterly fantastic. Why on earth were people insistent on pink? Just cause Lewa's a girl? It was because pink is a common sky color (sunrise). Pale blue would have also given the same effect. I can't believe it took me this long but I just realized a massive problem I have with these prints, they're all effectively palette swaps of the same design. Not like you're going to change them but I think they should have more variance in their designs, like nexo knights and Ninjago. You basically translated the early toa 'clone set' appearance into minifig form, which is kind of visually boring in my opinion. I mentioned nexo knights, and that's a good example of what I mean, they're all clearly on the same team but they all have unique characterful armor designs that are specific to the character. Also, now that I look at them again, there seems to be a problem with the consistency of the level of detail, namely that the abs are insanely more complex than the rest of the prints, so it creates a disconnect in the design. The masks still look a little more organic than I'd like, but they've grown on me, except pohatu, I've never been a big fan of the uniter design. Is there a blank for the Axel-fig design without any colors and prints? I'm interested in making minifigure designs and I couldn't find one for that body type. Unfortunately not by the looks of things, sadly. I can make one, though it won't be till this evening, due to work. I'll just make it an outline, and you can add whatever details you need. [Edit] - Sorry it took so long... I forgot about this once I got home. 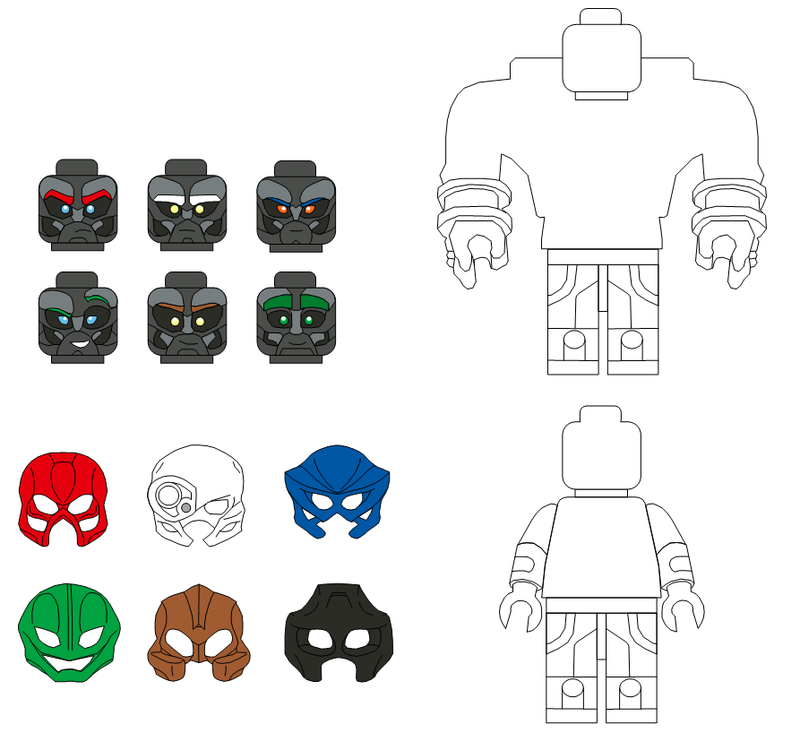 Here's a template for the axel-fig and a standard minifig, along with the toa heads and masks. So, this minifigures are very nicely done, but it's evident that IF there will be an official reboot for Bionicle,and it will be a system theme, then the minifigures won't have so many details. Like heck! They would very very very very very expensive to make! Even the waste have sooooooo many details! 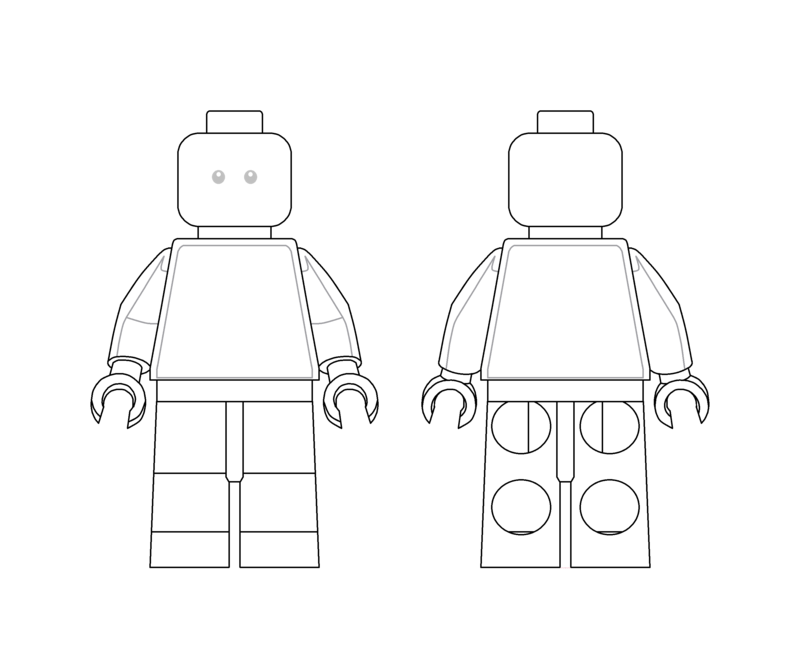 @Jon @IllustriousVar Where did you guys find the minifigure templates?